Barbara Dennerlein (B3); Magnus Lindgren (ten/fl/clt); Robert Ikitz (dms); Luca Alemanno (bs/Fender bs); Ardissa Assefa (congas/perc); Nicola Conte (gtr on 2 tks); Zara McFarlane (vcl 3 tks). Well it's that 'Bah Humbug' time of year (although others may use stronger adjectives) but, it's also a time to look at the positive side of Christmas. The festive season provides lots of work for musicians even though the jazzers may have to wear different hats to earn their mince pies. Also, the much maligned Christmas songs and carols that, every year, we are subjected to in supermarkets, malls, pubs, cafés and other dens of iniquity are, in many cases, actually very good tunes and, with different words, could be year round standards (challenge for budding lyricists - pen a romantic/non Christmas lyric to a carol or Christmas song!). In fact, with only three vocals (brilliantly done by Zara McFarlane), this is a great opportunity to assess the music without the distraction of the words. Apart from our B3ess (ooh sexist!) Lindgren blows gutsy tenor and flutes fluently. But Zara! oh Zara! I wanted more than 3! (Christmas Time/ Christmas Song - Mel Tormé would have loved this version and perhaps Elvis may have wished he'd done this Blue Christmas! Nah - only Jon Hendricks or Annie Ross could get even close! It's probably going to be one of the few Christmas offerings you'll hear that won't make you want to throw up! Dennerlein is up there in the B3 hierarchy (Hammond Hall of Fame/Down Beat's Instrumentalist of the Year several times over and, if there ever is a Pulitzer Prize for jazz organists, Barbara will be in there pedalling and pulling all the right draw bars). If she was playing organ in our local church on Christmas Eve I'd go to Midnight Mass and I'm not even a catholic! 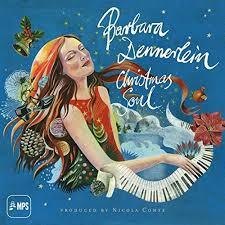 Barbara Dennerlein - Christmas Soul released Nov. 13 on MPS label.